CraftecInc Tonneau Covers inexpensively protect your truck bed. 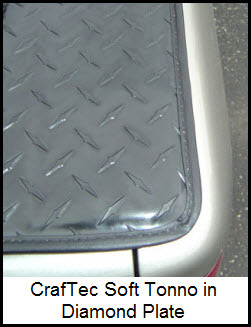 Craftec Inc Tonneau Covers have an ultra low profile that seamlessly melts into the sides of your truck bed. The standard Soft Hatch model is accompanied by the Tool-Box Custom Fit model to serve you whether you have a toolbox or not. 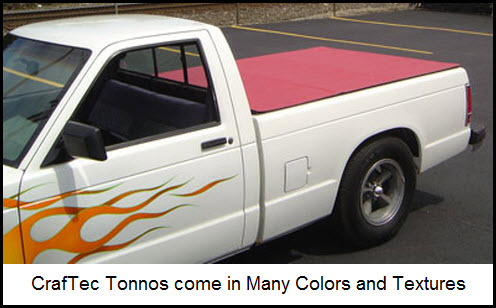 Note that both models of this soft tonneau cover come unassembled, require drilling into the truck in some cases and even though a clamp system is used it takes about 3 or 4 hours to assemble. For this little bit of extra hassle though, you save a lot of bucks for what you get. Check out the install instructions on the CraftecInc website (see above link) before you decide to go with this product. OK, here’s the long list of features. Cover Weight : 35 to 45 lbs.